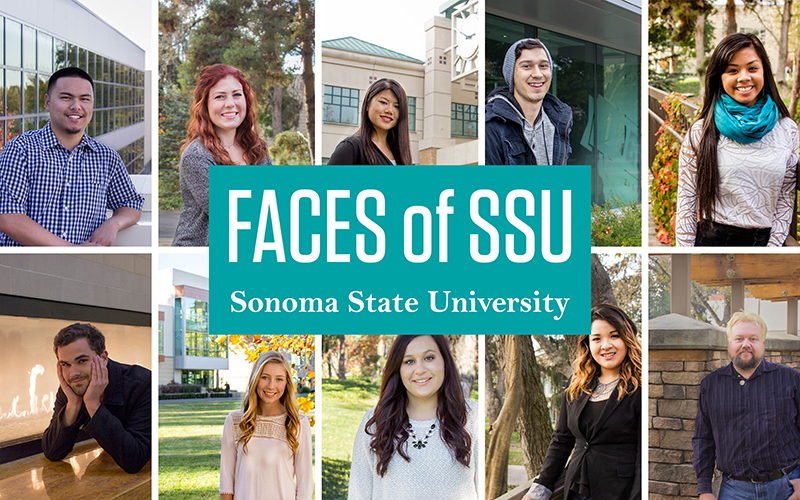 Twenty-five diverse student leaders at Sonoma State University have been selected to be part of the annual "Faces of SSU" campaign. Each student shares his or her own story about their life, campus involvement, and challenging and positive moments they have encountered at Sonoma State University. Their portrait and stories appear on banners hung throughout campus, as well as large poster boards on display in the Library and other areas of campus. This year's crop includes members of Associated Students, athletes, students returning to school after a 20-year break, and undocumented students, all with their own stories to share. Over 50 students were nominated by faculty and staff to be a part of this year's campaign. Nominees were required to be a registered student for the 2016-17 year, be actively involved in the nominator's department, and contribute positively to the overall Sonoma State community. A committee comprised of students and staff reviewed all nominations and helped choose the 25 students. Faces of SSU began in 2012 with the these theme of, "We are all Seawolves, and we are more than how we look, sound or appear to others." The goal is to encourage students to share their own experiences with each other. The Faces of SSU exhibit kicked off with an opening reception on April 5 in The HUB. Many of the Faces of SSU students were in attendance and spoke about their experiences and what the campaign means to them. The poster board display will be in the Student Center and Recreation Center through April 9, and at the Library April 18 through May 13. Banners will be up from April 9 through June. Faces of SSU is sponsored in part by campus life programming and The HUB. For more information visit http://www.seawolfliving.com/facesofssu. I write to provide assurance that we will continue to make every effort to provide a safe and welcoming campus environment for all our students, faculty, staff, alumni and members of the community. The "Diversity Dialogue: Envisioning the Future of Diversity at SSU" is April 25 from 2-3:30p.m.in Schulz 3001. The Diversity Dialogue Planning committee has planned the event with the purpose of joining a collective effort to identify the future of diversity at SSU.